Contrary to what most people, it is OKAY to have burgers for breakfast. Why not? Since I had burgers at midnight before, I don’t see why I can’t have them for breakfast. Ladies and gentlemen, the Epicurious burger ($18) serves one if your name is Brad, or two if you don’t have a big appetite. Add cheese, bacon and egg ($2 each, or $4 for all 3 toppings) for the “full epicurious burger experience”. This baby is humongous! I started breakfast with Pancakes ($7 for 3) of course. A lot of syrup was consumed and I ate the three pancakes on my own. What an achievement! It may not seems like a lot to you, but pancakes mean the world to me. I’d marry any one who makes me pancakes for breakfast. One of my favorite breakfast items on the Epicurious Cafe’s menu is the Baked Eggs with toast soldiers ($6.50 for 1). We ordered two portions and the first one that arrived was splendid. There’s something special about the combination of eggs and bacon in semi-molten form. Unfortunately, the second serving was rushed out of the oven way too early, and the baked eggs was too watery. The Cafe offered to replace the Baked eggs with the Choco-nana sandwich ($6). Now, nutella is surely one of the best creations on earth. Spreading a thick layer of the wholesome nutella on white bread is the most sensible thing a person can do. My middle name is nutella. Look, I’m not saying Epicurious Cafe has the best brunch in Singapore. But for the kind of price and the comfort food they serve, Epicurious cafe is definitely still one of my favorite breakfast places in Singapore. I’m probably not going to blog about their breakfast again. So if you know what’s good for you, go to Epicurious cafe (or any brunch places) today for a good Sunday brunch. Western fare with Eastern plates. Fusion? hey I’ve been to epicurious (robertson quay) a number of times and always had the baked eggs, but they were 12.90 I think. definitely nowhere near 6.90. Are the prices different at the 2 outlets? I’m extraordinarily picky about pancakes, but the rest looks fantastic! The presentation – the little slices of watermelon with the baked eggs, the carefully placed scatterings of fruit, the way the egg is draped just so over the burger in the top picture – is perfect. 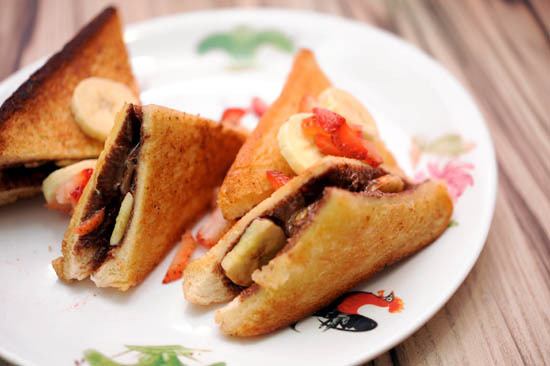 And I have to say I am very tempted by the choco-nana sandwich… I can practically taste it just from its appearance and description. did i miss out something? the last picture… looks like a sandwich or sorts? superb post once again. thanks! Epicurious is definitely one of my fav places for brunch.. I will be going here this weekend, counting down to the weekend already. 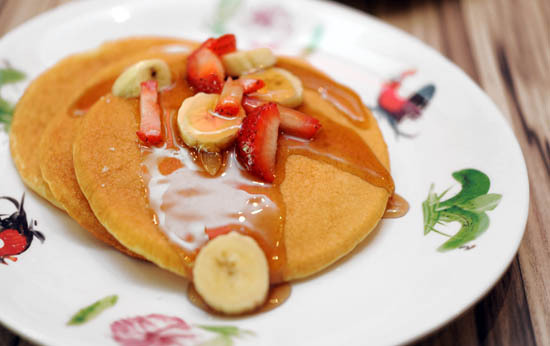 Btw, do you know that Rider’s cafe no longer offers Pancakes? imagine the shock I had after making a reservation a week in advance only to find out that there is no more pancakes. that day i went and the baked eggs were overcooked =(( nothing to dip the toast soldiers into. the croque madame is actually very nice! I am finally going to Epicurious this weekend! Haha can’t wait! Eli: extraordinarily picky? sounds like you are quite a big pancake person! heh oh yes, anything-with-nutella is always nice! stefanie: THE WEEKEND IS ALMOST HERE! hee report back to me after u have the brunch! Oh my god, you kidding right? how can riders cafe NOT serve pancakes? i haven been back for ages. do they have any new items on the breakfast menu? danghl: baked eggs, pancakes, eggs ben, get them all!